During his six-year stint on “SNL,” Fallon ventured outside NBC with great success. Small parts in Cameron Crowe’s “Almost Famous” and Tom Hanks’ and Steven Spielberg’s “Band of Brothers” led to starring roles in the feature films “Taxi,” with Queen Latifah, and “Fever Pitch” with Drew Barrymore. Not a stranger to hosting award shows, Fallon has hosted the MTV Movie Awards twice — in 2001 with Kirsten Dunst, and solo in 2005. He received critical acclaim for his September 2002 hosting of the MTV Video Music Awards, featuring a musical opening where he parodied the year’s best videos by Eminem, Avril Lavigne, The White Stripes, Dave Matthews, Nelly, and Enrique Iglesias. “Late,” a “Lost” parody where Jimmy and his staff are trapped on a deserted floor at 30 Rock and fight to find their way back to the show. Mick Jagger appeared in the series as a “Desmond”-like character forced to keep entering data into a computer to prevent the world from blowing up. ”Robert is Bothered” where Jimmy plays “Twilight” star Robert Pattinson, sitting in a tree on the 30 Rock roof garden, citing all the things that “bother” him. The real Pattinson joined Jimmy in the tree in March 2010, and claimed that Jimmy’s impression “bothered” him as well. “The Real Housewives of Late Night” where Jimmy’s “wife,” Denise (played by Jimmy Fallon), fights with the “wives” of his staff. Audience participation bits like “Lick It For Ten,” “Competitive Spit-Takes,” and “Freestyling with The Roots.” Songs and musical impressions, including Fallon as Neil Young singing the theme to the “Fresh Prince of Bel Air,” and Fallon and The Roots as “Ladysmith Snack Mambazo” singing about snack foods like Hot Pockets and Ben & Jerry’s ice cream. In addition to ruling the time period in ratings, “Late Night with Jimmy Fallon” has been praised by critics. The show has won an Emmy and has been nominated for four others. In 2010, Fallon hosted the NBC telecast of “The 62nd Primetime Emmy Awards,” live coast-to-coast, from the Nokia Theater in Los Angeles. 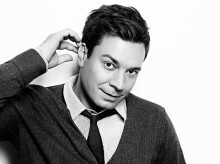 Fallon is set to take over as the host of “The Tonight Show” following the 2014 Winter Olympic Games. Outside of hosting, Fallon has released two comedy albums. His second comedy album “Blow Your Pants Off,” released in 2012, features songs from his “Late Night” impersonations, such as Tebowie and Neil Young. The album is also notable for its guest appearances, which include Stephen Colbert, Eddie Vedder, Bruce Springsteen, Paul McCartney, Justin Timberlake, Dave Matthews, Big & Rich, and newscaster Brian Williams. The album won a Grammy in 2013 for Best Comedy Album. Fallon is also the creator and one of the executive producers of “Guys with Kids,” part of NBC’s 2012-13 television schedule. Do you want to hire Jimmy Fallon? Directly request a quote. In 48 hours we can send you the availability of Jimmy Fallon If you would like to book Jimmy Fallon, Entertainment Booking Agency is the right place. We will offer you the best price and contact the management or we directly contact Jimmy Fallon. For corporate appearances or speaking engagements you can contact our agents and the will help you true the process. Tags: hire Jimmy Fallon, Jimmy Fallon booking, book Jimmy Fallon, Jimmy Fallon appearances, find more information on booking Jimmy Fallon for appearances, Jimmy Fallon speaking engagements, Jimmy Fallon endorsements/spokesperson, Jimmy Fallon appearance fees, Jimmy Fallon booking agency contact info, biography of Jimmy Fallon, Contact an artist booking talent agent find a speakers bureau that can book Jimmy Fallon, speaker booking agency for Jimmy Fallon, Jimmy Fallon booking agency, Jimmy Fallon booking for corporate event. EBA is one of the biggest entertainment booking agencies in the World. We book hundreds of celebrities, artist, athletes and speakers in a year. Important to know is that we are not claiming to be the management of Jimmy Fallon. We are not the official agent for Jimmy Fallon. Companies from around the globe book these artists and speakers true our company be course we have one of the biggest networks and we always have direct contact with the artist or the management. We help you to find the right celebrities for your corporate of private events. Please contact one of our agents to get free advice and we will help to get the world-famous artist on your party.